Buttery and sweet, these are lovely holiday cookies. The best part, however, is the dollop of jam in the middle. Next time, I’ll make bigger thumbprints to fit in more jam! Preheat oven to 350 degrees F. Line 2 baking sheets with parchment paper or silicone mats. Bake cookies until the edges are golden, about 15 minutes. (For even color, rotate the pans from top to bottom about halfway through baking.) Cool cookies on the baking sheets. 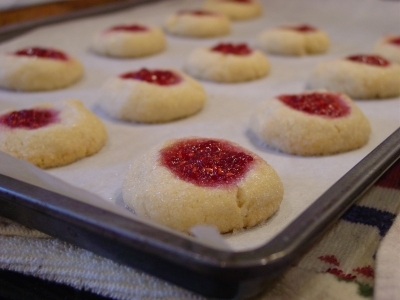 Store cookies in a tightly sealed container for up to 5 days. ← Retro Recipe Challenge #5: Boozy Holiday Round Up!